A hybrid golf club combines some of the better elements of irons and woods. As the game of golf has progressed into the 21st century, the modern advances in technology have led to many innovations in the equipment available for a golfer to take onto the course. One such innovation is the creation of the hybrid golf club, which features a fuller head than an iron, but a shallower head than a wood. While the hybrid club is mounted on a shaft that more closely resembles an iron shaft, it contains a head that is deeper than a standard iron. 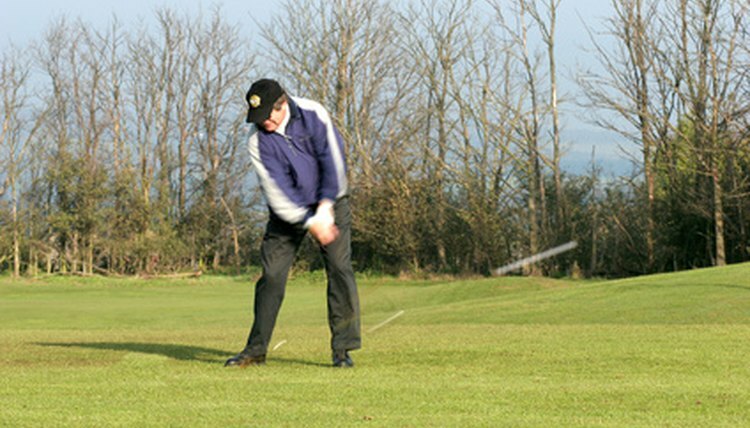 The center of mass of the head is pushed farther away from the face of the club and closer to the ground. With this lower sweet spot, the club more consistently makes solid contact with the ball and elevates it off the ground, even with swings that may produce a "thin" shot with an iron. With the face of the club larger than an iron, but smaller than a standard wood, the hybrid club offers the player the chance to play the ball where a standard wood might not perform well. A good example of this is a ball that's lying in challenging rough. With a favorable lie, the hybrid can be used to hit a ball in a case when a standard wood would fail. The distance that a ball hit with a hybrid club travels when struck more closely correlates with the iron of the same number than it does with a wood of a matching number. While a 5-hybrid offers less distance than a 5-wood, the 5-hybrid can be expected to give a golfer about 5 to 8 yards more than a 5-iron would. Though the distance traveled by a ball hit with a hybrid club is very similar to the distance traveled by a ball struck with an iron, the trajectory of the balls aren't very similar. In addition to being easier to elevate, balls struck with hybrid clubs are likely to travel higher than those struck with corresponding irons. The number of hybrid clubs to carry is a matter of personal taste, and if the option is available, a golfer is advised to try both the hybrids and the irons they would be replacing at a driving range to compare comfort and performance. As a general rule, golfers should carry at least one hybrid and should consider using a hybrid to replace any low iron that they are not comfortable hitting.